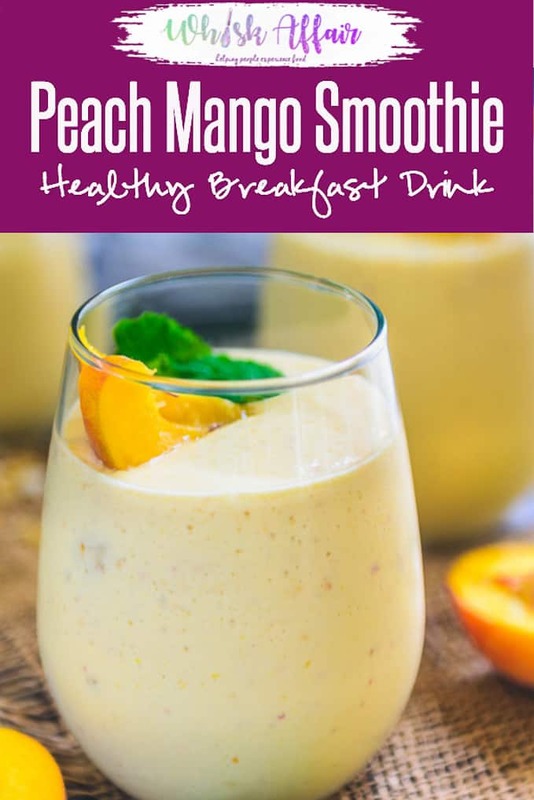 Healthy Peach Mango Smoothie is a delicious choice to have for breakfast. Make it in Almond milk and Soy Yogurt for a Vegan Version. Here is how to make Mango Peach Smoothie Recipe (Step by Step). Why not combine two absolutely delicious tropical fruits to create something delicious? Mangoes are in season in India and you’ll be greeted by boxes full of mangoes as you enter the market or grocery store. 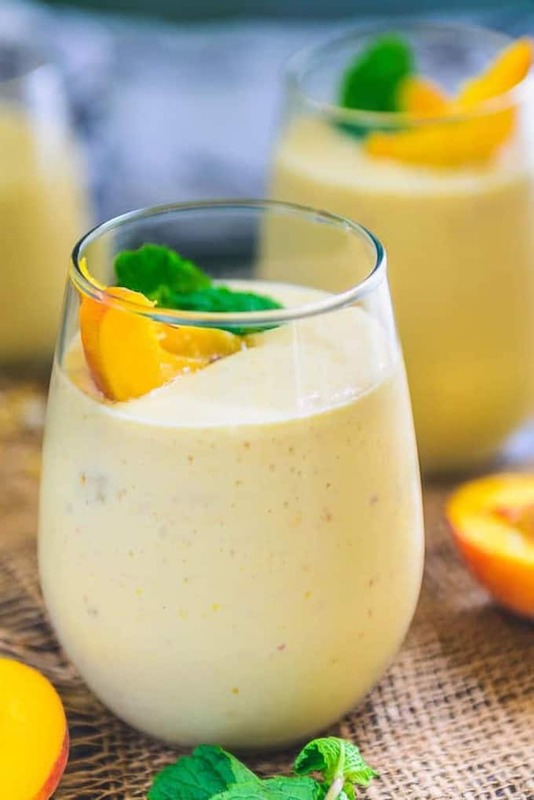 With the goodness of two delicious fruits, this Mango Peach Smoothie is not only slurp worthy, but you can reap the benefits of a morning glow too. It’s just the perfect smoothie to have for breakfast and you can also take it with you to office or send it with the kiddos as a healthy and quick snack. A sip of this smoothie will automatically make you feel like you’re on that much needed tropical vacation. Peaches are great for weight loss, beautiful skin and it’s also a stress – reliever. Mangoes are a great source of Vitamin C and A, it’s also great for digestion, skin health and hair. Do I need to give you any more reasons to combine these sun-kissed delicious fruits? What I love about smoothies is that is keeps you full for a longer time. So instead of spending hours deciding on what to make for breakfast, especially on a lazy Sunday morning, treat yourself to this super simple smoothie. A really healthy habit would be to incorporate a host of different smoothies in your diet so that you get the benefits of many different fruits and veggies, some of the other healthy smoothie recipes you could try are: Pumpkin Pie Smoothie, Mango Banana Green Smoothie, Strawberry Colada, Orange Flax seed Green Smoothie, Oats Banana Cinnamon Smoothie, and Mango Vanilla Smoothie. 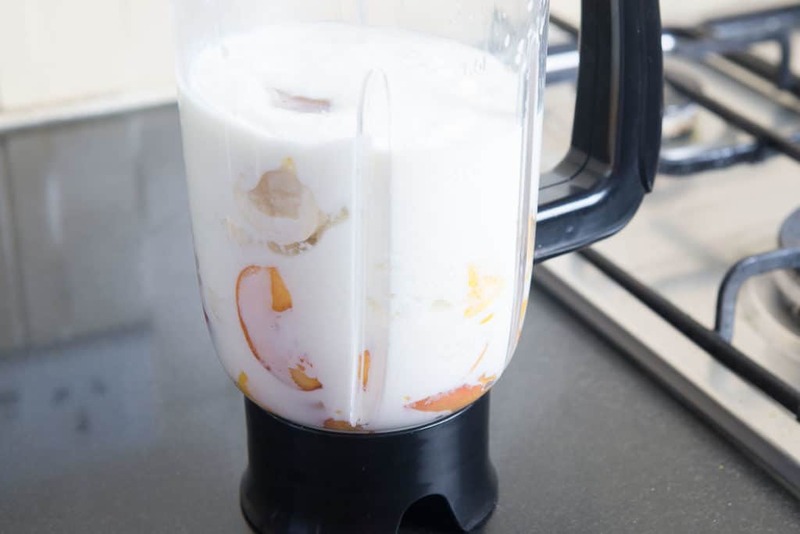 To make this Healthy Peach and Mango Smoothie Recipe, add peaches, peeled and chopped mangoes, a frozen banana, chilled milk, chilled yoghurt and honey in a blender and get blending until you get a smooth and lusciously smoothie consistency. The frozen banana and peaches added gives this smoothie a delightful creamy texture that you’re going to love. You can use fresh or frozen peaches, generally for smoothie recipes it’s recommended that you use frozen fruit as it blends really well. Once the mix is blended into a smoothie, it’s poured into serving glasses and garnished with some fresh peach slices and mint for that beautiful touch of freshness. It’s best to serve the smoothie as soon as it’s made, while chill, so that it retains all the freshness of the fruit. So the next time you’re planning on creating a quick and delicious breakfast smoothie, try this divine combination that you’re going to fall in love with. Here is how to make Peach Mango Smoothie Recipe. You can add different fruits in this smoothie and make a new variation every time. I like to add strawberry and pineapple in mine. You can also add apple, kiwi, banana etc to yours. You can also make this smoothie with yogurt only or add some milk to it to make it thinner. Make vegan version of this smoothie by replacing regular milk with almond milk, yogurt with soy yogurt and honey with maple syrup. You can freeze peaches and mango when they are in season like I do and then keep using it throughout the year. You can do the same with blueberries and other fruits too. You can add more ingredients and make a new variation every time. Add peach, mango, banana, low fat milk, low fat yogurt and honey in a blender and blend until smooth. Pour the smoothie in serving glasses. Garnish with peach slices and fresh mint. Serve chilled. 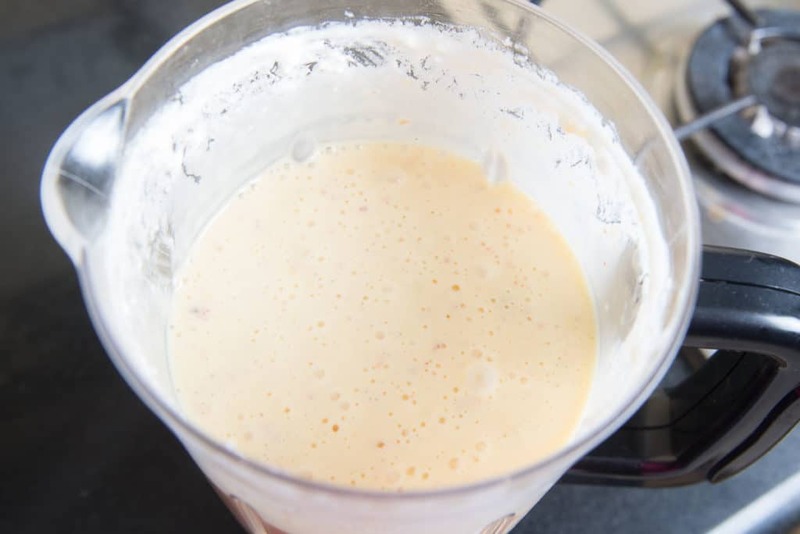 Step by Step Healthy Peach Mango Smoothie Recipe. 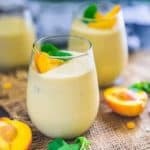 Healthy Vegan Peach Mango Smoothie Recipe is a delicious and healthy choice to have for breakfast. Make it in regular milk if Almond milk is not available. Pour the smoothie in serving glasses. Garnish with peach slices and fresh mint. Can you use water or milk?? ?